One after another they come in: The calls for robberies in progress or robberies “just occurred” in the Loop and Near North areas sometimes come in waves of three or more. The frequency and brazenness of the muggings are often reminiscent of CWB’s early days when Wrigleyville and Boystown were the city’s most robbery-laden neighborhoods. Thanks to community pressure and a couple of responsive police commanders, things are better in Lakeview for now. But the clean-up took almost three years to complete. Now, our old problem has found a new home in Chicago’s tourism and business centers. • At 3:40 p.m., an 80-year-old man was robbed as he walked out of Chase Bank, 1122 North Clark. The victim told police that he was in the bank doorway when an unknown offender distracted him by saying there was something on his pants. He then restrained the man, dug into his pocket, took his wallet, and fled. The offender was described as a black male in his mid- to late-30’s who stands about 6-feet tall, weighs 150 pounds, and was wearing a blue jacket with blue jeans. He was last seen heading south on Clark. The case is similar to the February 17 robbery of an 81-year-old man in Lakeview. In that case, the offender patted the victim on the back, saying that there was a spider on him. He then proceeded to take the elderly man’s wallet by force, according to cops. • About 20 minutes before the senior was robbed this afternoon, a man walked into a Loop convenience store and announced a robbery in the 600 block of South Dearborn. The clerk activated a silent alarm and refused to hand over any cash. The suspect fled, but was captured by cops nearby. Charges are pending. • In the Jewel incident, a woman reported that a man grabbed her wallet out of her purse as she left the grocery store around 3:45 p.m. The thief then jumped into a red Chevy Sonic with Wisconsin plates that was occupied by two other men. A police officer who saw the car idling moments before the robbery described the vehicle’s occupants as three black men: one wearing a black jacket with a blue dress shirt another wearing all black, and the third having no further description available. A similar wave of robberies was reported early Saturday, with cops handling three muggings in about two hours. • Around 3:30 a.m., a taxi driver reported that he was robbed at gunpoint near Halsted and Hubbard by three men, one of whom had a gun. The offenders took his phone, wallet, cash, and chauffer’s license. The incident was captured on his taxi’s surveillance system, he said. He described the offenders as three black men in the mid-20’s wearing dark hoodies. They were last seen running from his cab on the corner of Washington and Green. • A tourist reported being robbed at 3:49 a.m. outside of the Hotel Palomar, 505 North State. The hotel front desk called police for the guest who reported that he lost his Rolex to a robbery crew that was using a black Chevy Malibu. Police described the suspects as two black females who stand about 5’5” tall. One wore a heavy black leather jacket. The other was skinnier than the first, but no further information was available about her appearance. They were last seen driving southbound on State Street. • A United Airlines employee was robbed by two men outside of the company’s Willis Tower headquarters at 6:45 a.m. The man said he was on the Franklin side of the landmark skyscraper when two offenders approached and attempted to rob him. The victim was able to break away from the thieves who were described as two black males. One stands about 5’10” tall, is about 25-years-old and was wearing a red coat. Chicago cops have made a series of robbery arrests in the Loop and Near North areas over the past 10 days, but new hold-ups continue to be reported at a mind-numbing pace. 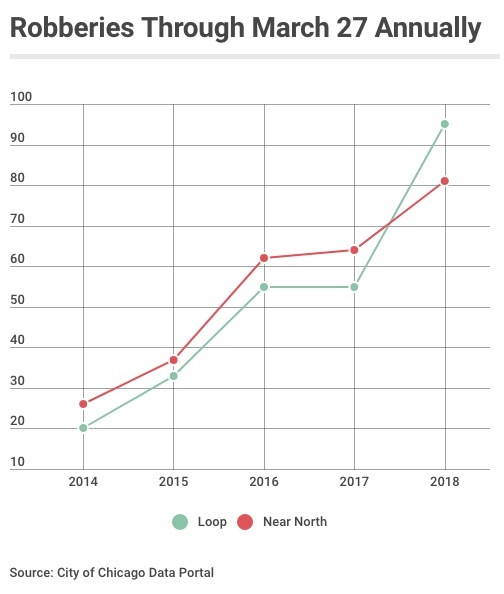 Through March 27, robberies in the Loop are up 82% compared to the same time period last year. Compared to 2014, Loop robberies are up 375%. Near North has seen a 27% year-over-year increase in robberies. Compared to 2014, muggings in Near North are up 211%. Support CWBChicago for as little as $49 a year or $5 a month. April’s member’s only perks include first-quarter crime performance reports for North Side neighborhoods.